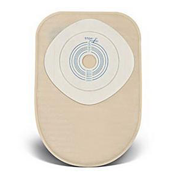 Colostomy One-Piece Pouches are a type of ostomy bag where the pouch and the flange, or adhesive base plate, cannot be separated. 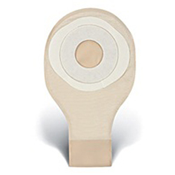 The pouch attaches to the skin around the stoma using the flange. Because of their design, one-piece pouches typically have a lower profile and are less visible under fitted clothes. The flange and the pouch also have zero chance of coming apart. This design is a great choice if the user wants to prioritize discretion, security and ease of use. NewLeaf Home Medical offers a wide variety of one-piece pouches. 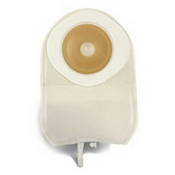 Simply choose from our featured items to see more Colostomy options for Closed One-Piece Pouches and Drainable One-Piece Pouches.